Moonmirror is the first in the Moon series, a trilogy by the Dartmouth-based children’s writer Catherine Bond. 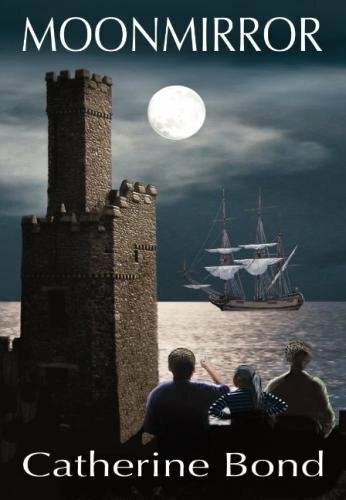 Aimed at children aged around 9 – 12 years, this is an exciting adventure with pirates, and time-travelling back to the Civil War. The book has also proved a big hit with adults, who perhaps yearn for a less sophisticated era before the digital age, when adventures in our own back yards – in this case in the woods and seas around the children’s home – seemed more possible. The book has elements for older children (taken prisoner – how will they get out?) and also for younger ones, such as the friendly robin, Freddie, who helps them, and the charming mice. Children are at the core of Moonmirror and its successor novels and the parents are incidental figures in the background. Catherine paints a vivid picture of the area, enough to make me visit the castle and the famed tearoom! I even went into St Petrox Church and looked into the flower-arranging cupboard where the mice live, but they must have been hiding. It’s a lovely part of the country and well worth exploring. Catherine’s writing brings it alive! Writing is a very personal process but there comes a time when the writer has to hand it over, in the first step towards publication. Like all successful authors, once she had finished writing the story, Catherine called in a professional copy-editor, in this case me, Sarah Smith from Charwell Proof Plus, to cast an eye over the typescript to check for any typos, punctuation issues and inconsistencies (if it’s a tearoom in one place, it can’t be a tea room elsewhere!). The copy-editing and proofreading stages (final reading of the ‘proofs’ in order to catch any errors that may have crept in) are vital in order to get a top-notch book. You can find out more about Moonmirror on Catherine Bond’s website, and order your copy. The second book in the series, Moonglimmer, is now available. I hope you enjoy reading them both!